Meeting strangers can be scary enough for even the most outgoing person. 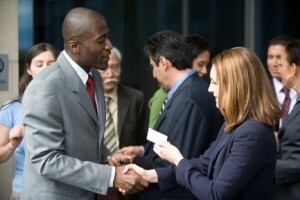 But meeting people at work functions and trying to network can be very daunting. How do you introduce yourself? How do you avoid the awkward silences? And how to make the best first impression you possibly can. No need to fear, we’re here to help! Here at Adzuna CA, we have come up with 5 great tips to be a successful networker. Not sure how to break the ice? There is no need to memorize cheesy one-liners or over complicate things. The best advice is to keep it simple. Introduce yourself and ask a question straight away to get them talking. “Hello, my name is ___! So, what brings you here?’” Always remember to smile as this goes the extra mile. If you were an Olympic runner you wouldn’t just sprint into a race without warming up. The same goes for networking. Ease yourself into the event by talking to a few people before targeting the big dogs. This will help to feel more relaxed and comfortable. In no time at all, you will be talking to the most important CEO in the room with total ease. Make sure you come armed with a few great questions. This is a great tactic if you are feeling a bit nervous as it keeps the other person talking plus it makes you appear interested and engaged. The most important thing to remember to succeed at networking is to have fun! At the end of the day, people are more likely to enjoy your company if you are enjoying yourself. So keep your chin up and have a great night! Tagged under: career,	network,	networking.